Microsoft has just published its third-quarter results, and they paint a very bleak picture for Windows Phone. Sales of Lumia devices were down 73% compared to the same quarter last year, with just 2.3 million devices sold – during the same period in 2015 8.6 million were sold. That's resulted in a massive 46% drop in phone revenue, though it's easy to point to a relative lack of new devices, particularly at the high end, as one of the factors. 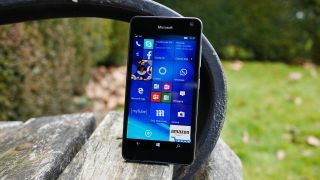 The Microsoft Lumia 950 is the latest flagship available – and that launched around five months ago, in November 2015, so it's no wonder sales have stalled. But that can only tell part of the story. Even last quarter Microsoft only sold 4.5 million Lumia devices, which is hardly a huge number compared to its contemporaries, and was down from 10.5 million during the same period last year. This all seems to show that even the launch of Windows 10 Mobile has done little to slow the decline of Windows Phone, and that its days could be numbered. It's not all bad news for Microsoft though, as while its $3.8 (£2.6/AU$4.9) billion of total net income and $20.5 (£14.3/AU$26.4) billion of revenue are both down a little from this time last year its tablet business is showing growth. Surface-related revenue is up 61% at $1.1 (£0.76/AU$1.4) billion for the quarter, while last quarter also saw healthy Surface revenues. Microsoft hasn't broken down the figures, but claims this increase has been driven by the Microsoft Surface Pro 4 and Microsoft Surface Book. That's still a drop in the ocean compared to Apple's iPad revenue though, which in quarter one of 2016 stood at over $7 (£4.9/AU$9) billion and has rarely dropped below $4 (£2.8/AU$5.1) billion. Surface sales aside it looks like Microsoft's mobile devices could be in for a continually rough ride this year, with the Surface Phone rumoured to be a 2017 launch, and little else of substance on the horizon. The Lumia 650 is a strong phone, but is it good enough to turn the tide?